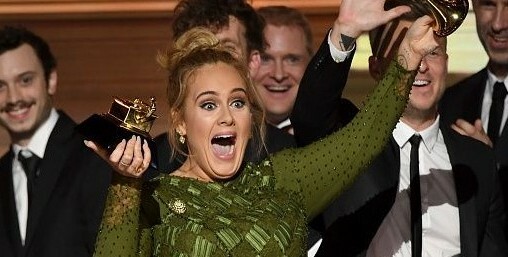 Adele won the hearts of many, and it wasn’t for her strong vocals. The singer took home five Grammy Awards including song and record of the year for her hit, “Hello,” but it wasn’t until she won album of the year for “25,” that she moved the entire audience to tears including Queen Bey herself. “But I can’t possibly accept this award and I’m very humble and very grateful and gracious, but the artist of my life is Beyoncé and this album to me, the ‘Lemonade’ album is so monumental, Beyoncé. So monumental. And so well thought out, and so beautiful and soul bearing. And we all got another side to you that you don’t always let us see and we appreciate that … all us artists here [expletive] adore you. You are our light. And the way that you make me and my friends feel, the way you make my black friends feel is empowering, and you make them stand up for themselves. And I love you. I always have; I always will. As the camera captured Beyoncé’s reaction is was clear she was moved and we even saw her mouth the words “I love you so much.” To many, this was a moment. Black girls everywhere felt both understood and appreciated. The album “Lemonade” was triumphant for women everywhere, but specifically black women. It was an album filled with encouragement and empowerment. Beyoncé showed the world how beautiful and strong black women are.